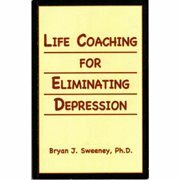 The item Life coaching for eliminating depression, Bryan J. Sweeney, (electronic resource) represents a specific, individual, material embodiment of a distinct intellectual or artistic creation found in Austin Public Library. "I feel lost, afraid, like I'm in a black hole, an endless pit, like I'm drowning. I feel that my life is being sucked right out of me. I cannot escape. I'm trapped. I'm alone and I'm sad. My energy has been zapped, I cannot eat or sleep; when I do sleep waking up is painful. My muscles are tense and I am nauseous. Nothing good can happen to me. I have no focus, no concentration, and I have been unable to feel pleasure for some time. My world is falling apart and I don't know why. My life is getting worse and all my joy is gone. The worst part is, nobody understands. Nobody gets me. Nobody cares. I'm alone. I AM DEPRESSED."